It suddenly dawned on me a few weeks ago that now I am not working full time in a ‘normal’ job that I can do whatever the heck I want to with my hair. When I was a hotel manager for a large company we had to have ‘natural’ looking hair, and actually the rules have since relaxed a little which I am pleased about because how a person looks doesn’t stop them dealing with a problem or a situation does it? I feel the same about tattoos, too but that’s a whole other blog post. Anyway, I can basically do something with my hair other than run of the mill things like block colour or highlights. I’ve actually been pretty adventurous with my hair in the past. As a natural dark brown, blue eyes girl I have gone bleached blonde, green all over, purple chunky highlights, red all over, green and purple highlights, braided blue and purple extensions (big up to my friend Holly for spending two solid nights doing that for me!) and all manner of ‘natural’ coloured dyes, reds, coppers and blacks as well as Ombre. I actually really loved my ombre hair, it was a labour of love as I did it all myself but I finally worked out the right timings and dyes to use to get it looking just right and I only got rid of it for my wedding as I wasn’t sure such a modern style would be what I wanted to look back on when I show my grand-kids my wedding album! 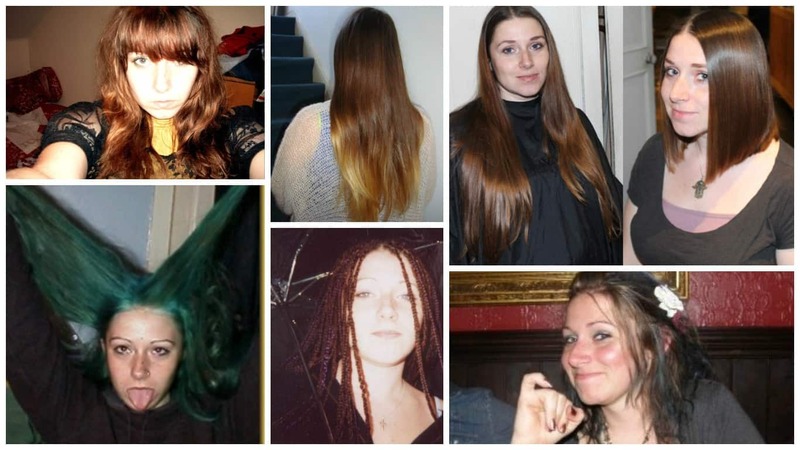 My hair has been all lengths from a bob to bum length, I donated 16 inches to Little Princess Trust a few years back to be made into a wig for a little girl who needed one, and I think I’d like to do that again at some point. Since my wedding my hairs has been highlighted in salons a few times and I’ve done a couple of at home box dyes myself when they grew out and looked naff. I last had highlights in September and now have 3 inch roots as my hair grows so fine. Currently my hair is level with the band of my bra at the back but I rarely wear it down. I could find ONE picture of me with my hair down on facebook/instagram since Arlo arrived 20 months ago, and that was because it was my birthday and I’d made an effort! I tend to just fling it up in a messy ‘mum bun’ forget about it. I wash it in the bath or shower in the evenings every two days and often go to bed with it wet so it looks even more naff in the mornings. But now Arlo is old enough not to pull my hair which was my excuse for keeping it up before, so I want to attempt to make more of an effort with it and maybe a good way to do that would be to do something with it colour-wise! I can’t really afford to go a salon and have anything amazing done but I really do fancy a change now I’m not restricted by work! One day I would LOVE to have tiny little dreadlocks, I’d keep them neat and rolled and not let them turn into big old manky ones, but I think actually they would take a lot of time to do and to keep looking good. I’m toying with getting a fringe cut in as I’ve not had one for absolutely years but always get immediate regret when I do have one as I touch it a lot and it looks greasy really quickly as a result. I think the easiest thing to do would be an all over colour, in terms of upkeep, but maybe I should go all out and do bright purple, or pillar box red? Then I can just re-dye it when it fades. But part of me still really wants to go back to ombre hair again, although I think it’s now officially called ‘balyage’ now! I first did in in 2010, can it really still be ‘in’ now 7 years later? More importantly do I really care if it’s fashionable? What was your craziest hair style? What do you reckon I should do with mine?